Halloween used to be a big holiday for us. We would have big parties and invite lots of our friends and cook LOTS of weird foods. But it's been more than a decade since our last party (2005, I think) since we had uprooted to California then retreated back to Oregon. We are dipping our toe in again to see if it's still our thing. We're having a smaller gathering where we'll feature our weird foods and probably play some games. Jeff is actually working this week with his friend Eric, so I'll be spending my time trying to finish up Jeff's and my costume and cleaning house. In the evenings, we'll both be working on whatever food prep can be done ahead of time. 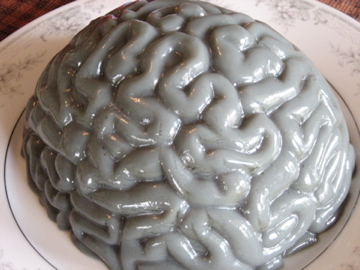 Brain Jello on left, Kitty Litter box cake on right. 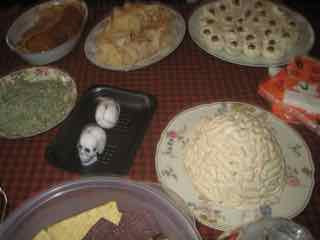 Not a great picture, but the brain is a crab dip with chips. In the background is eyeball deviled eggs. Sorry for the crummy quality photos. It guess it's been long enough that the best pictures have all been lost or are residing only on ancient backup drives. Sadly, I'm too lazy to go looking. 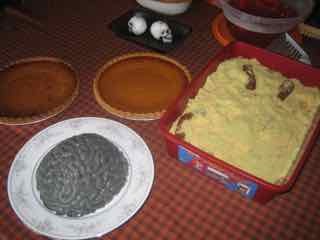 Update: Here are the pix for the food this year on our food blog. There is a separate post about the graveyard cake, which we were happy with how it turned out. We use these picture hooks to hang lights. They work great. I'm pretty sure we bought one of those hooks (we bought one of each from them), and our rail was too thick for it to clip on it. But I guess I'll go dig around for the hardware box and see if I can find that hook again to verify. I'd really like to find a solution, at least for next year. The plain brass picture rail hooks I bought (from House of Antique Hardware) don't always for our moulding perfectly, so I've bent and adjusted them as necessary for a secure fit. You may be able to adjust them with pliers with some rubber pads tapes on, and use a pipe or dowel mandrel to bend them around. If yours are brass, they should be soft and ductile enough to bed quite a bit. Science Fiction fans I knew used to call it a Thing Dinner.It was potluck, and one of the star attractions was often whole roast Cthulu (calamari). You're right--the catbox does look disturbing.